I was introduced to the art of John Dermot Woods through his collaborative novel with J.A. Tyler, No One Told Me I Was Going to Disappear. Woods’ sketches of mouth-less equestrians brandishing lollipops and Jesus literally handing his gooey heart to a creepy child straight out of a 1950s nursery rhyme nightmare serve as a perfect complement to that text’s hypnotic strangeness. A series of images that skew familiar cultural tropes by embellishing them with a quintessential sadness, memorable hints of a larger void. 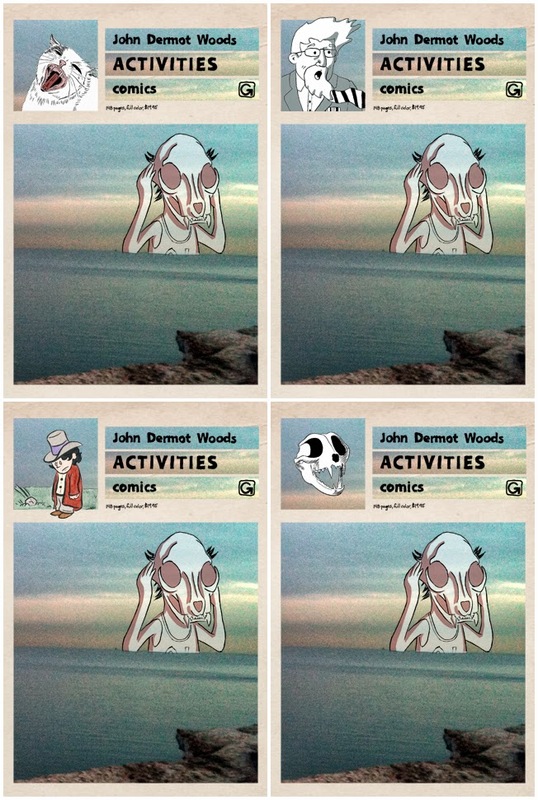 I picked up Woods’ new collection of comics, Activities, hoping for more of the same. That hope turned out to be misguided in the best possible way. Activities’ fully fleshed, darkly beautiful parables reverberate with a deeper but no less indelible fire, a psychological potency on par with the best literary fiction, and an earnestness that is a source of odd comfort and, at the same time, totally paralyzing in its clarity. The book opens with a series of full-page, caption-less illustrations, where each one, whether gorgeously colored or starkly black and white, is a story in itself. Why is that pelican’s neck in a noose? Why is that man kneeling, staring into a truck’s headlights and why is the woman he’s with not doing anything? These are the seconds before the implosion, frozen but always pulsing. Activities’ next and largest section (and its strongest), “Stories,” is composed primarily of multi-paneled narratives, some drawn with sharp black ink, some in fuzzy colored pencil, all striving toward a profound – and often heartbreaking – emotional resonance. 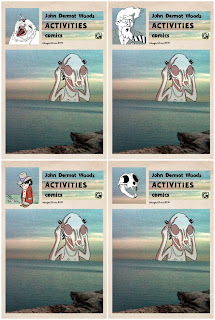 Being relatively inexperienced with comics, my first impulse was to compare the way I felt after reading “Stories” to the 3eanuts.com Tumblr, where classic Peanuts strips are presented without their final panels (the location of the closing joke that conceals “the existential despair of [the characters’] world”) thereby allowing anguish to prevail. But this really isn’t an apt comparison because Woods’ comics allow for a much greater complexity of feeling, amplified by the surreal quiet that seeps into the smallest spaces. A man staring pensively at a rocket that will take his partner to space completely encapsulates the wrenching finality of a nearly dissolved relationship. A close-up of a sneaker and its accompanying leg walking over dead leaves seems the only appropriate epitaph to a story about loss and the possibilities of lives not lived and decisions left unmade. The dialogue is mysterious and subtle, laid bare to let the ink bleed through. And bleed it does. The book closes with “Recognitions,” drawings combined with a random assortment of text from internet communiqués, Lindsay Lohan films, and work from authors as seemingly incongruous as Sigmund Freud, Andy Rooney, and the American Automobile Association. While not as striking as the previous section, “Recognitions” injects a bit of levity into an otherwise mostly somber enterprise. After all, who wouldn’t want to feel the elation of sharing a movie theater with Mark Strand?